The River Basin lies between the Spine Ridge to the north, and the Cherry Hills in the south. It holds the meandering Mistbane River, the life blood of the ancient and dreaded wood, the Darkenfold. Here trails switch back on one the other through a country haunted by small dragons, wild eschl and will o wisps. Travel here is difficult and dangerous. Follow the trail into the Bolan Drops and climb the high country overlooking the Wingnut Bottoms, travel onto the Lake of Nunt, to the banks of the Watchita River, all in the tracks of an Oath that passed through the words many years ago. 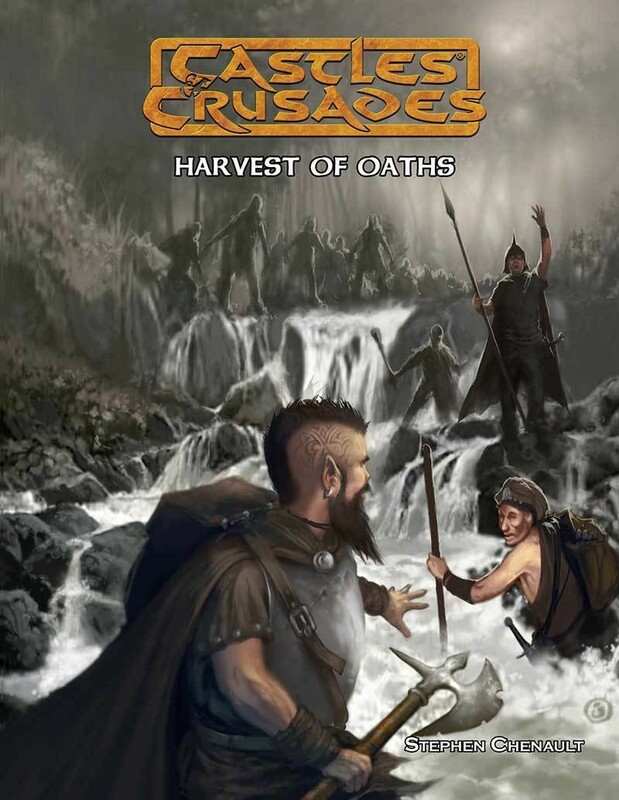 Harvest of Oaths is a series of encounters that can be played together as a loosely linked story for an overland campaign, or broken into pieces and played separately. The adventures are designed for mid-level characters, but are fairly easy to scale for high and low level characters. Plunge once more into the Darkenfold and explore the haunts of the River Basin Country.